"I know how comfortable it is to curl up with a nice, fat book full of big words and think you're going to solve all the problems of the universe. But you're not, you know. A bit of action is required now and then." While Hitler's propaganda machine churned, so did the Allies'. Mrs. Miniver may be classified as such, but to label this film as mere propaganda would be a grave injustice. There is certainly more substance here than one may initially believe. Certainly, the film does not attempt to hide its motive: to inspire people to get behind the massive war effort building to meet one of history's most evil forces. It's sunny nature and wholesome attitudes do not overpower its bold yet subtle messages on the dark reality of war. This film is a rare balance of Hollywood glitz and poignant social commentary. A fine, upstanding citizen, Mrs. Kay Miniver (Greer Garson) is enjoying the pleasures of life in Britain. Like a good cinematic wife of the time, she is concerned about spending too much money on extravagant things, but does not regret spending a chunk of dough on an elegant hat. The same goes for her husband Clem (Walter Pidgeon), whose ambition overcomes his hesitation as he buys a spanking new car. These are the trademarks of calming, pre-war luxuries. Life is somber, peaceful and fulfilling, not merely because of possessions, but because of the loving, warm relationships between husband and wife, and their three children: Vin (Richard Ney), the intellectual just back from Oxford; Judy (Clare Sandars), the responsible sister; and Toby (Christopher Severn), the rambunctious troublemaker who acts as a childish court jester throughout, eliciting both laughs and cringes. Even though the threat from Germany looms, the Minivers are able to maintain a sense of normalcy. When Vin returns from college and begins spouting about the injustices of the class structure, a young and beautiful visitor, Carol (Teresa Wright) puts him in his place, initially bruising his ego. Before long, the two fall in love and are engaged. Vin must overcome the critical eye of Carol's grandmother, Lady Beldon (Dame May Whitty), before the relationship can continue. The aristocratic Beldon is bitter about an upcoming botanical competition, in which her long running championship roses are under threat of being bested by a new hybrid grown by stationmaster Mr. Ballard (Henry Travers), named the Mrs. Miniver. However, more pressing events take center stage. At a church service, the news is broken: Britain and Germany are at war. Suddenly, cellars are converted into bomb shelters, blackout procedures are in effect, and air raid sirens are frequent. Vin, who has just joined the RAF, is called to battle, forced to leave his fianc�e behind. Before the tale ends, each individual must fulfill their duties, whether they are in a civilian or military capacity. Roses return, tragedy strikes, and the film ends with a powerful coda within the barely intact walls of a country church. 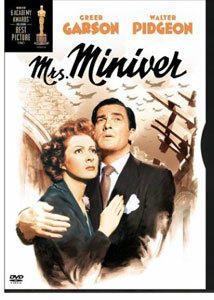 Directed by William Wyler, Mrs. Miniver is an excellent film, winning Best Picture in 1942. What is fascinating about this tale of a supposedly "average, middle-class family" (who live in a mansion and have a maid) is its depiction of war from within the walls of a house. Sound, suspense, and facial expressions emote the fear and uncertainty of such times to great effect. Greer Garson and Walter Pidgeon capture this concern, and subtly portray the dark side of war through silent, pregnant pauses that denote their apprehension and fear. Performances are outstanding all around. Another standout role, played by Henry Travers, is the gentle hearted Mr. Ballard, whose dedication to his work and roses add to the heart of the film. In the end, it is obligatory that these individuals show more nobility than fear, and we are not disappointed. It is individual courage, faith and the bond of family that helps these characters persevere. Even though there are some domestic elements that clearly date the film (Mrs. Miniver's clear, solitary "role" is to attend to house duties, and separate beds occupy the master bedroom) this message is universal. "When Hitler did his worst, Mrs. Miniver did her best." Image Transfer Review: Warner's luminous 1.33:1 transfer is outstanding, rivaling and even surpassing some of Criterion's best black-and-white work. Contrast is excellent, as is fine detail. Grain is present, along with some occasional print damage, but none of this is very distracting. Overall, this is a very clean print that shows Warner's capabilities with catalog titles�some of which have not been up to snuff recently. Audio Transfer Review: The English monaural audio is rather clean, but dated. There is very little range, minor hiss and dialogue can be hard to decipher at times. Still, this is about as good as a soundtrack from the period can sound. The French track is in worse shape, suffering from the same ailments as the English track, but with some very noticeable hiss. Extras Review: Warner has supplied a few more extras than usual. First, we have a short clip (:55s) of Greer Garson's Academy Award acceptance speech. Next, we have some interesting historical pieces in the form of two short WWII-era propaganda films, Mr. Blabbermouth (19m:19s) and For the Common Defense (21m:33s). These are always intriguing, and the quality is quite good. Finally, a still gallery of 30 images, most of which are candid behind-the-scenes photos, rounds out the extras. A standout film that surpasses mere propaganda, Mrs. Miniver is a charming film with a serious depiction of war in the suburbs. Strong performances and solid direction make it clear why this film was honored with Best Picture and should not be forgotten. Highly recommended.